The stunningly gorgeous Cantonese fine-dining restaurant Jiang-Nan Chun at the Four Seasons Hotel Singapore has a new Chinese Executive Chef. 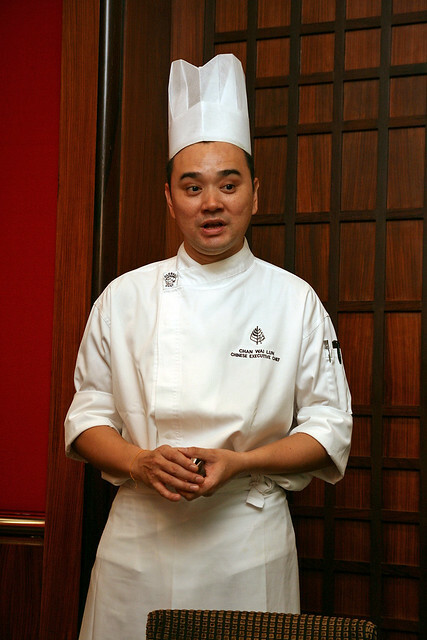 Chef Alan Chan is a Hong Kong native who has lived in Singapore since 2001. He joins Jiang-Nan Chun from Crystal Jade Dining IN at Vivocity where he was Master Chef. Alan recently collaborated with his counterparts at three-Michelin star Lung King Heen (Four Seasons Hotel Hong Kong) and the two-Michelin star Zi Yat Heen (Four Seasons Macao), so he's reinforced his direction and benchmark for Jiang-Nan Chun here. We had the opportunity to try some of his signature dishes at a media session where we also got to meet their new Director of Public Relations, Michelle Wan. Don't you love the lush greenery surrounding the hotel? Even though it's so near Orchard, it's got that prized serenity that is so relaxing, it's almost like a resort. 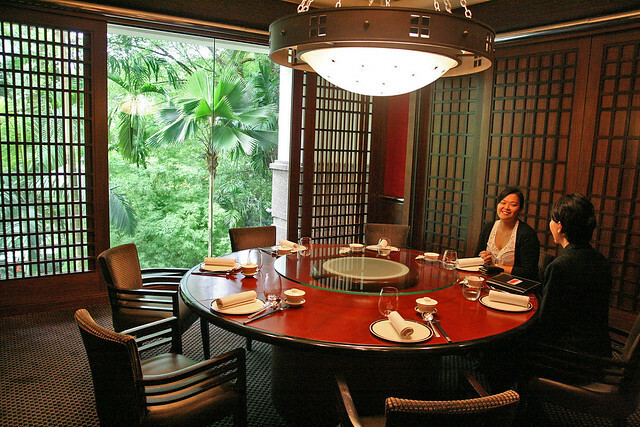 This is one of the three private dining rooms - Hangzhou, Suzhou and Yangzhou - which seat 14, 10 and six respectively. Great views. A Tomato Amuse Bouche kicked off the session. 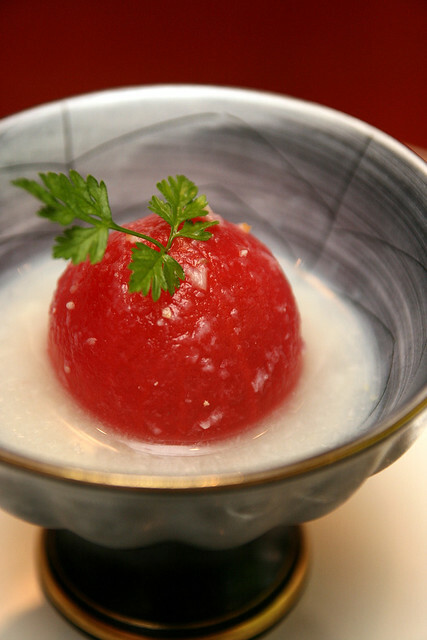 The slow-poached tomato in lychee did a good job of whetting appetites. And then onto some appetisers proper! 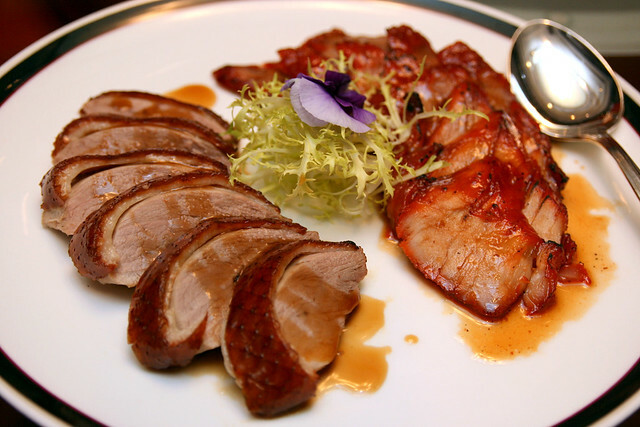 Roasted Duck and Roasted Char Siew - both tender and superbly marinated. I felt the char siew didn't need the red colouring - natural caramelisation and browning can look more appetising. The duck is really good though (and I'm not even a fan of duck). 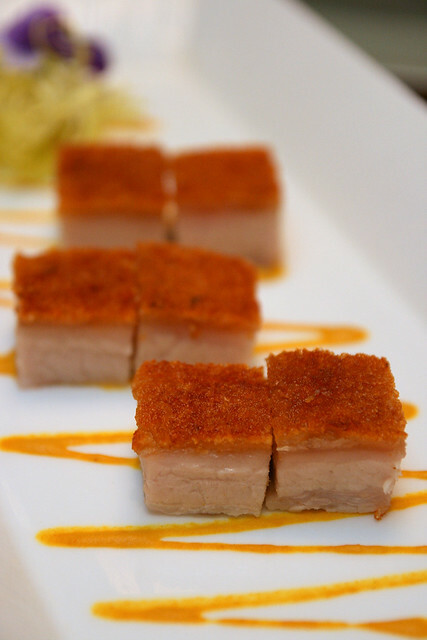 Roasted Pork Belly - done the way the Cantonese restaurants do best. Crispy brittle crackling atop nicely balanced layers of lean and fatty meat. Drunken Chicken Roll - interestingly done in a roulade, with a generous dose of wine. 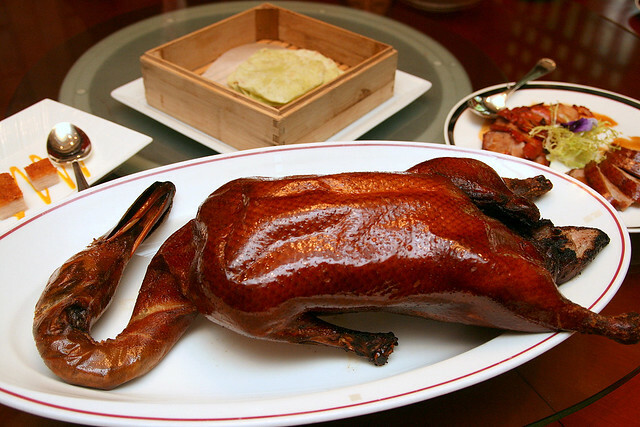 Peking Duck - could you ask for a more splendidly roasted bird? 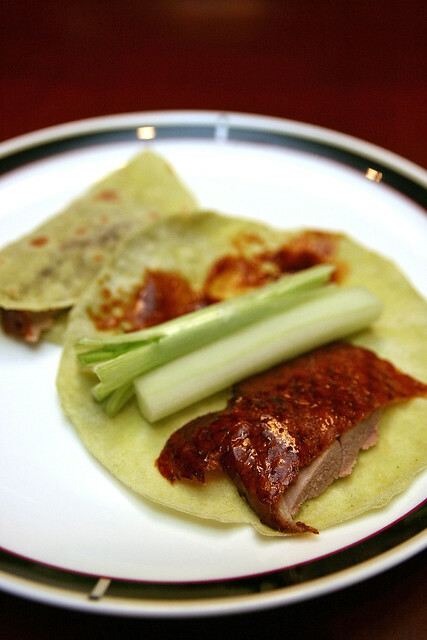 They serve the Peking Duck here with flour pancakes tinged green from spinach. We noted that the chef seems to like spinach, as you'll see. 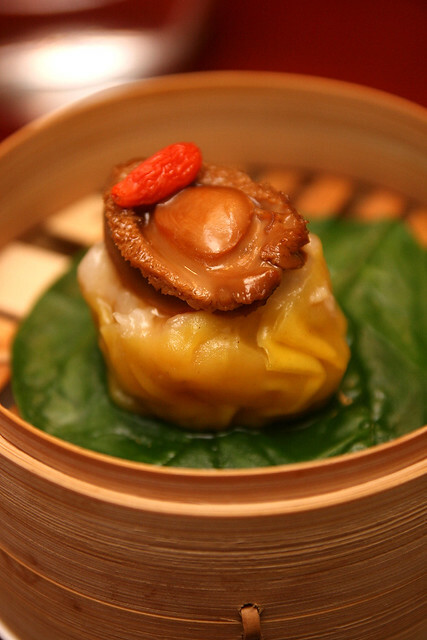 Of course, lunch would not be complete without dim sum. Actually, they serve dim sum all day! Our ears really perked up at the good news. It's so hard to find good dim sum in the evenings. The selection here is pretty good with unusual touches or extra thought put into the little heart-warming morsels. Some of them are just enough to make you wonder what the extra special flavour is, without being in your face. But others are bolder, and delightfully surprise your palate. 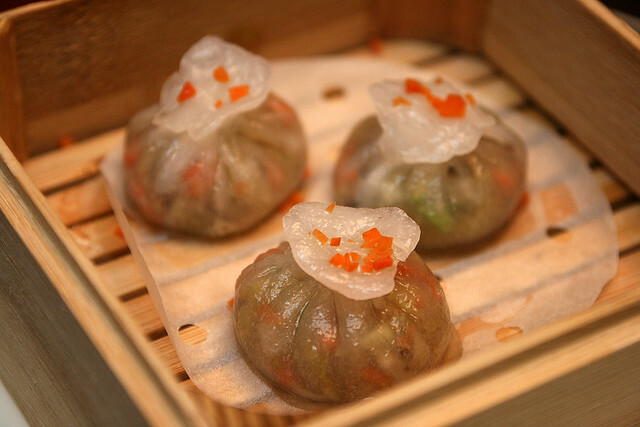 Steamed Pork Dumpling with Shrimp and Baby Abalone - decadence in a bite. 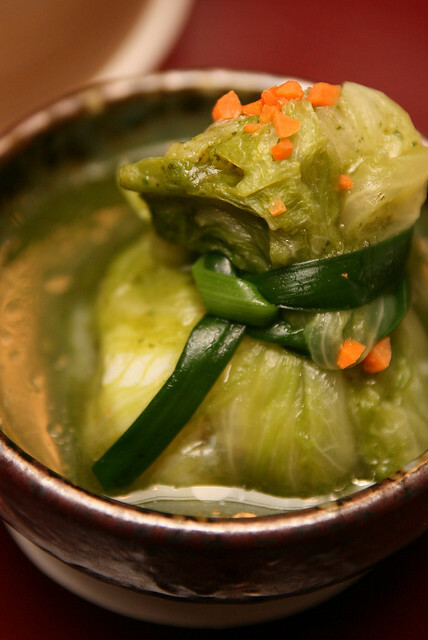 Steamed Scallop with Cod in Spinach Sauce and Truffle Oil - wrapped in cabbage and steamed in broth, this is definitely one of the healthier options on the dim sum menu. The spinach sauce is delicious - it definitely has a good stock base. Baked Flaky Pork Pastry with Bacon, Ham and Sesame Seeds - oh yes, we could taste the bacon in this one. 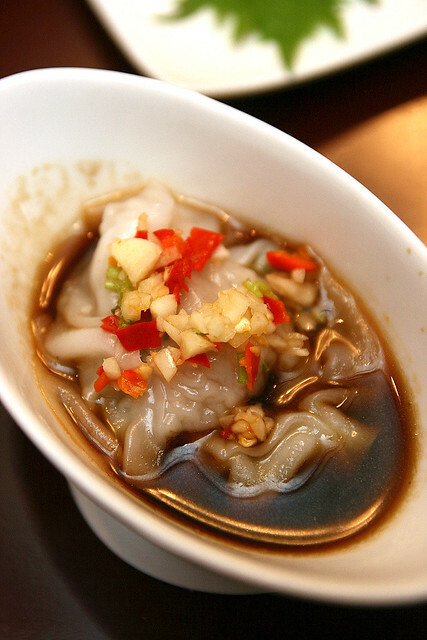 Steamed Pork Dumpling in Spicy Vinegar and Garlic - strong and pungent from the raw minced garlic. 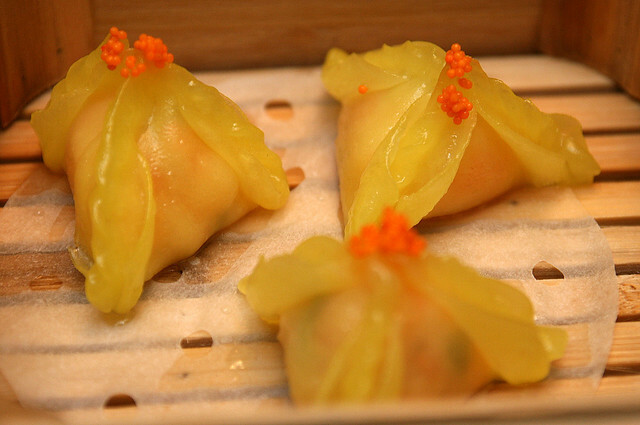 Steamed Lobster and Shrimp Dumpling with Shrimp Roe - your har gau gone deluxe! So pretty the presentation, and you can see how the thin skin is expertly folded. Steamed Mushroom Dumpling with Asparagus, Celery and Carrot - now these may seem like just vegetables, but what amazing flavour they had! So much so that they made an even bigger impact than the lobster and shrimp dumplings. Deep-fried Pastry with Salted Egg, Mushroon, Onion and Curry Powder - at first, these look just like the fried yam puffs, but bite into one and you'll see the flavours are so different. The curry stands out for me, although the others didn't detect it as much. 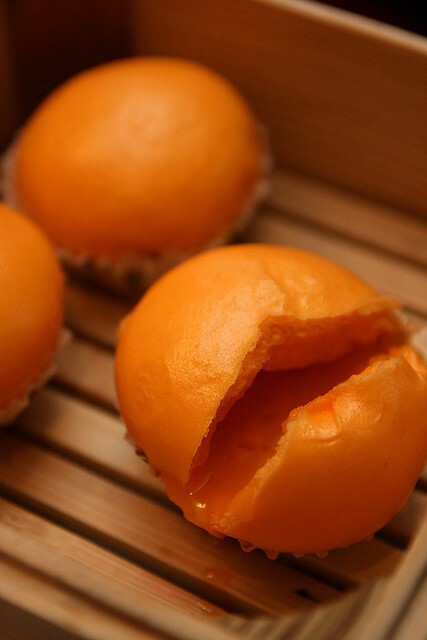 Very flowy salted egg yolk custard buns - eat carefully! These buns have very molten cargo. And now for the signature mains. Simmered Fillet of Star Garoupa with Beancurd Skin and Wolfberries in Carrot Broth - healthy and satisfying. This alone can be quite filling! 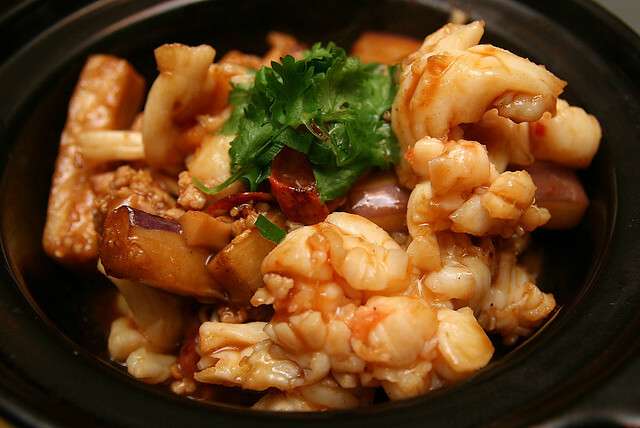 Wok-fried Spiny Lobster with Spanish Chorizo, Minced Pork and Egglant served in Claypot - probably my favourite dish of the lot. The combination along with the slightly spicy seasoning is just mouth-watering. 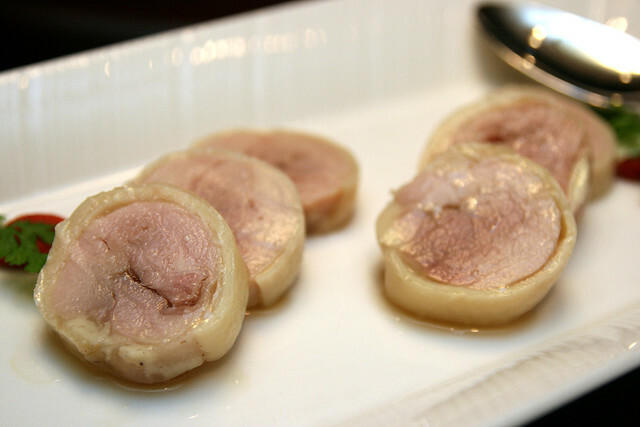 Double-boiled Sakura Chicken Soup with Chinese Pear and Fig. 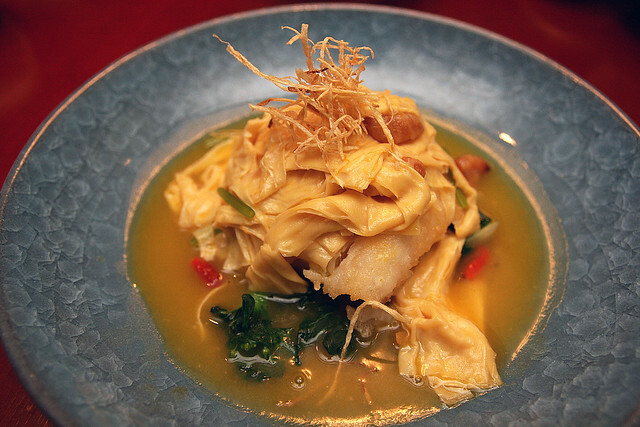 Chef Alan Chan likes to innovate with nuances of flavour. 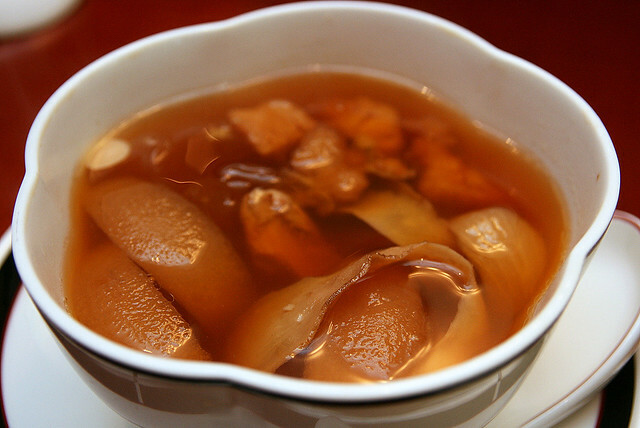 Here the pear and fig not only lend sweetness to the soup, but also help to add a cooling effect to the body system in Chinese traditional medicine terms. Great for our sweltering weather. A good Cantonese soup can be so fortifying. 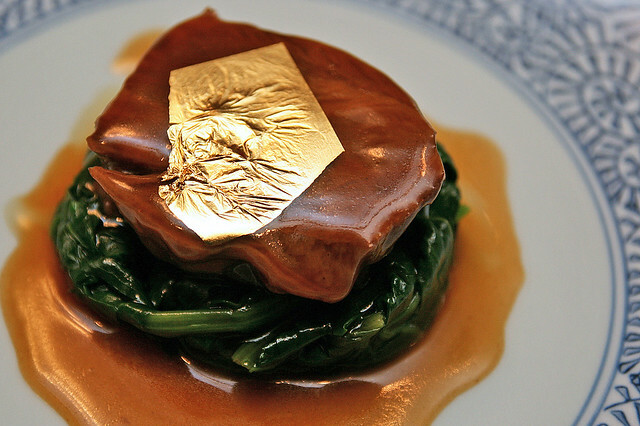 Braised Beef Cheek in Sweet and Sour Sauce and Gold Leaf - beef so tender, even sous vide can't put up a fight to create this kind of texture and flavour. Hey spinach! Both will give you iron, so eat up! The final noodle course is also another of my favourites. 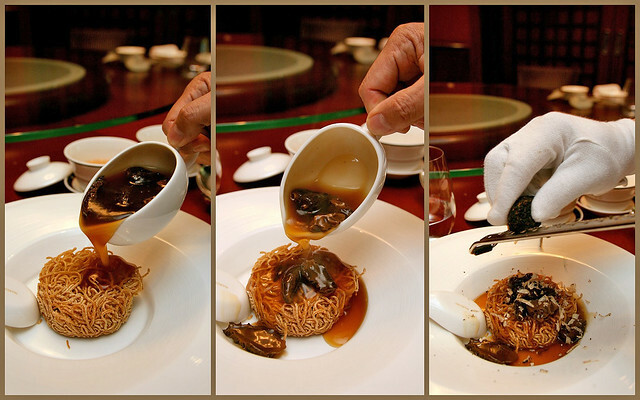 Morel mushrooms in sauce being poured over crispy noodles. The noodles have already been seasoned, so they are already peppery and flavoursome. The mushroom sauce adds more umami punch, and the shaved truffles crown the noodles with luxurious aroma and taste. 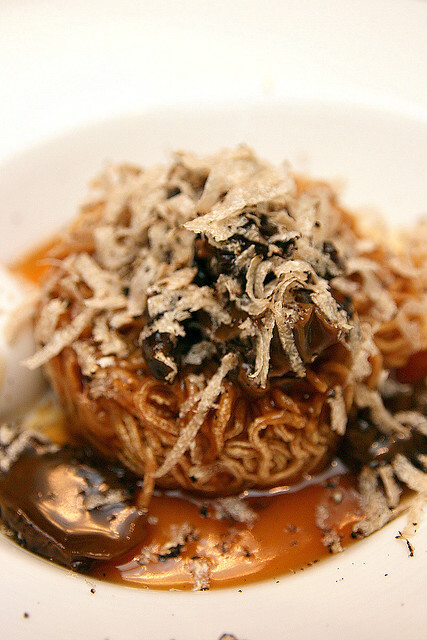 So here you have it - Crispy Noodles, Fresh Morel Mushrooms, Shaved Summer Truffle. Deservedly over-the-top. I would so come back for this! 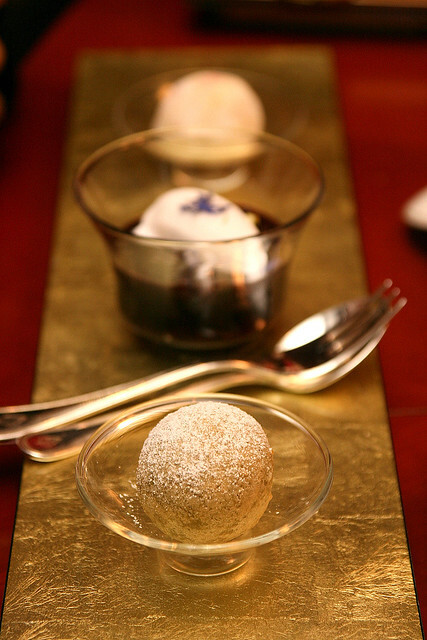 Trio of desserts: Homemade coconut ice cream served with black glutinous rice, Deep-fried Green Tea Dumpling. Pulut hitam given a twist with coconut ice cream instead of coconut milk. 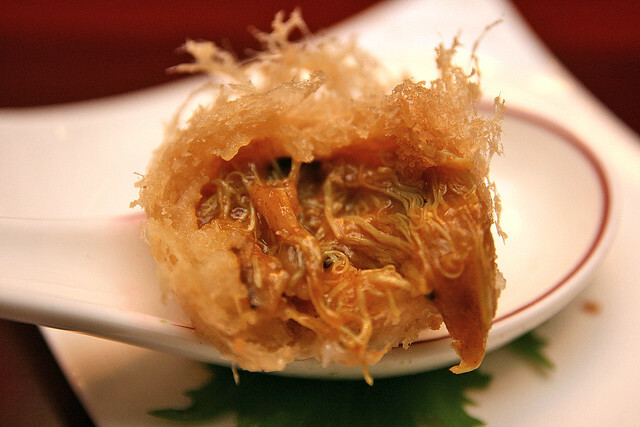 The Deep-fried matcha dumpling is a textural delight - I had to ask how they managed to fry it. At the far end is a mochi-like dumpling, which also was as tasty as it was cute. It looks like Chef Alan Chan has done a marvellous job with the new menu. We loved his enthusiasm as he explained each dish in Cantonese, and the Restaurant Manager Ng Chong Kim gave a darn near poetic translation of all he said, in English/Mandarin. 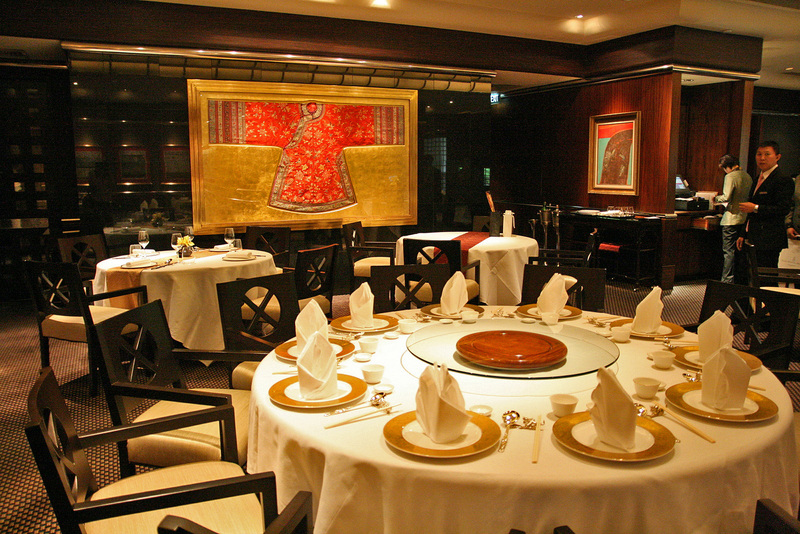 Jiang-Nan Chun also has a Weekend Oriental brunch featuring 101 items of dim sum and popular dishes in unlimited servings. 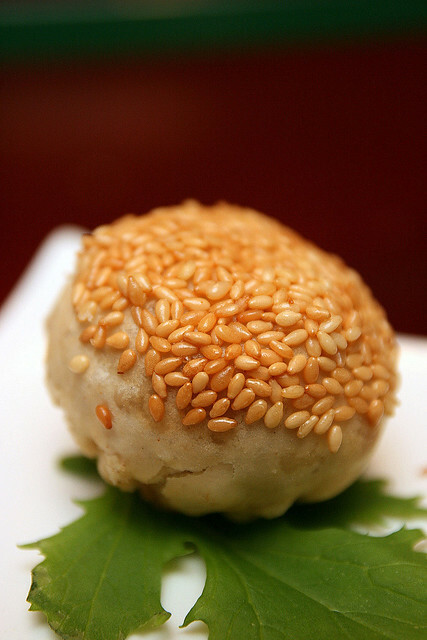 But lunch or dinner any other day looks just as good for their dim sum (again, I say, available all day!) and some of their special dishes. Check out also their National Day dining promotions - on Aug 9, the Oriental brunch goes for S$47++ per person instead of the usual S$58++, inclusive of Peking duck and free-flow juices! Many thanks to Michelle Wan and the Four Seasons Hotel for the invitation and for hosting the lunch. The gold has no taste, but it sure makes a gleaming statement! oops! cikipedia is http://ccfoodtravel.com/ sorry forgot to change it! Homemade coconut ice cream served with black glutinous rice is something anyone could hardly resist.The place is a real paradise for lovers of excellent food.